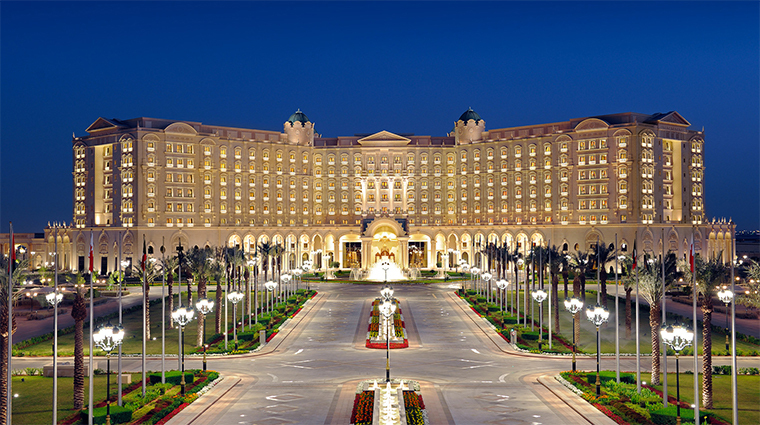 The Ritz-Carlton, Riyadh oozes palatial luxury befitting royals and government dignitaries — in fact, the building was originally designed as a royal palace before opening as a hotel in the heart of Saudi Arabia’s capital in 2011. 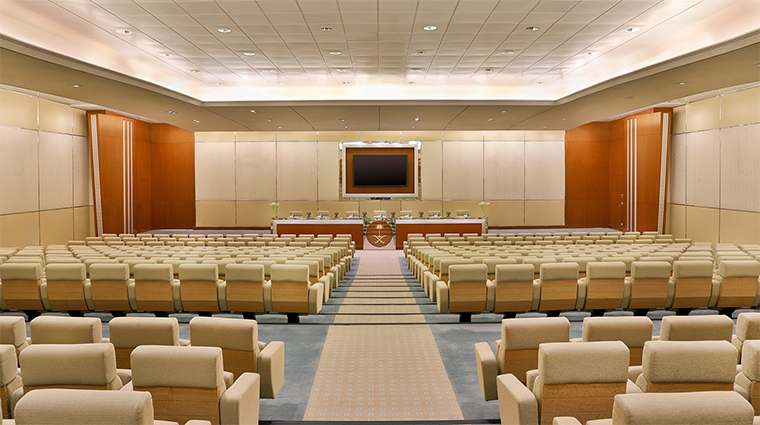 The posh property sits on 52 acres of manicured grounds with 492 guest rooms that put you within easy reach of the nearby Diplomatic Quarter and King Abdulaziz Conference Center next door. This prime locale (not to mention supremely sumptuous interiors) have attracted a roster of high-powered guests, including state officials like Barack Obama, Hillary Clinton and Donald Trump. 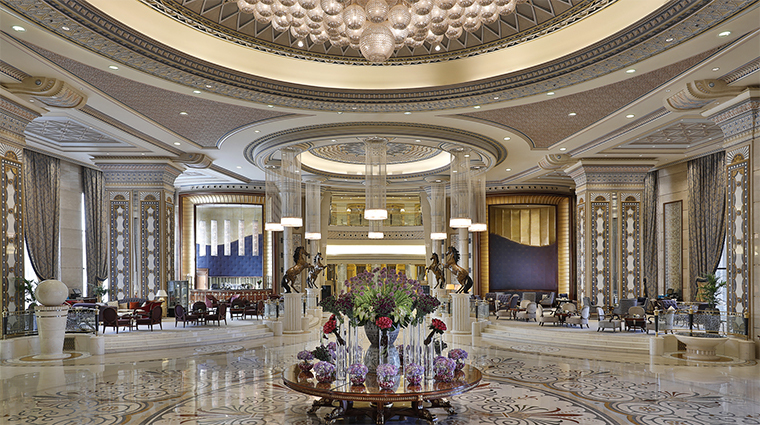 Upon arrival at the lavish retreat, you might be forgiven for thinking you’ve entered Versailles: a grand archway and impressive water fountain greet you before you set foot inside an opulent marble-clad lobby accented by gold and dark wood features at the reception area. 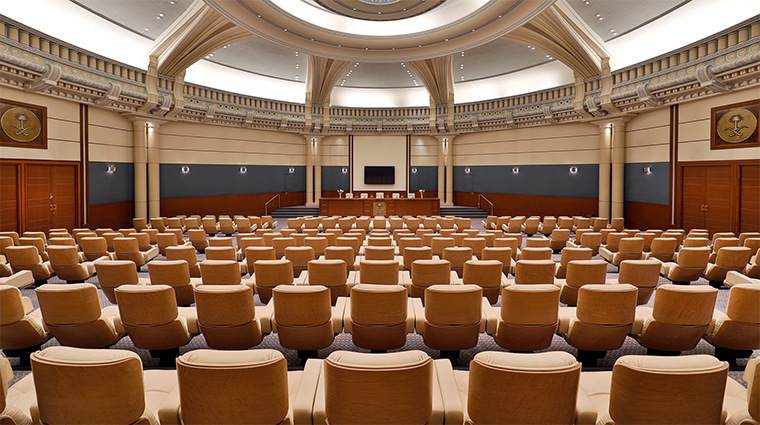 Attention to detail is evident from every angle with ornate ceiling moldings and sparkling chandeliers built to dazzle. This hotel boasts one of Riyadh’s best indoor pools. 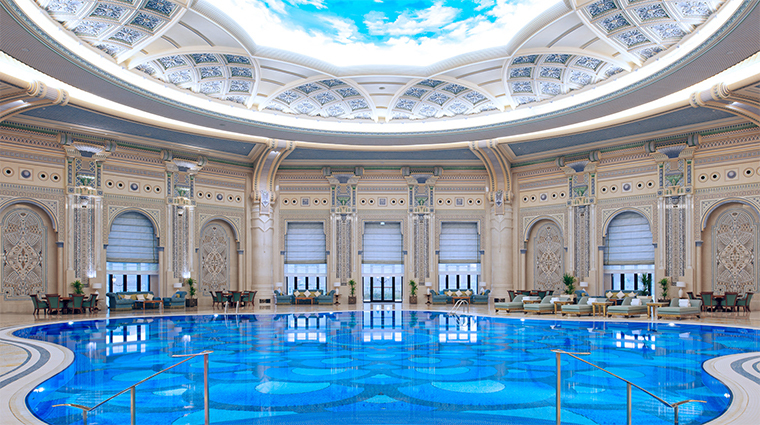 With marble mosaic floors and an immense sky-themed fresco covering the ceiling, the space evokes the feeling of swimming under an Italian masterpiece. 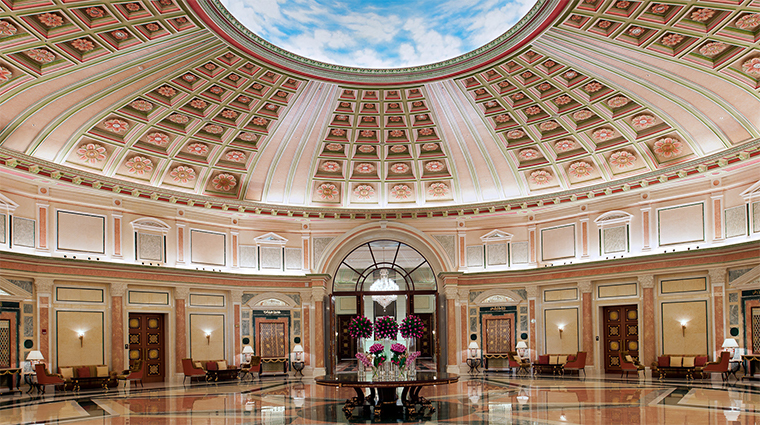 Get a taste of local culture in the opulent lobby of The Ritz-Carlton, Riyadh each evening. 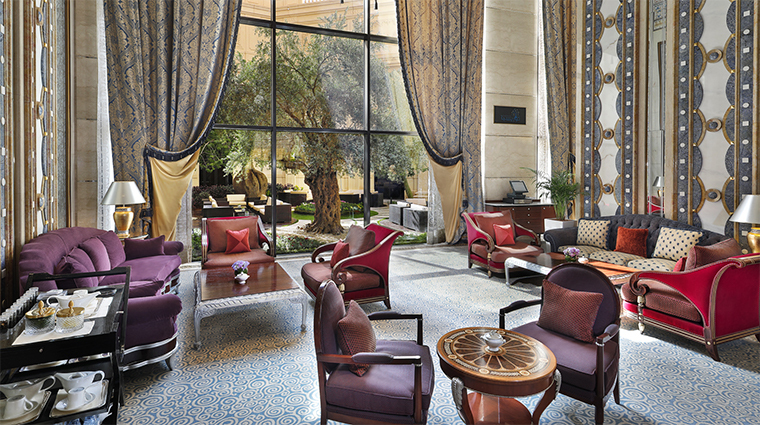 Listen to traditional music while sipping incredibly smooth Arabic coffee paired well with local dates. 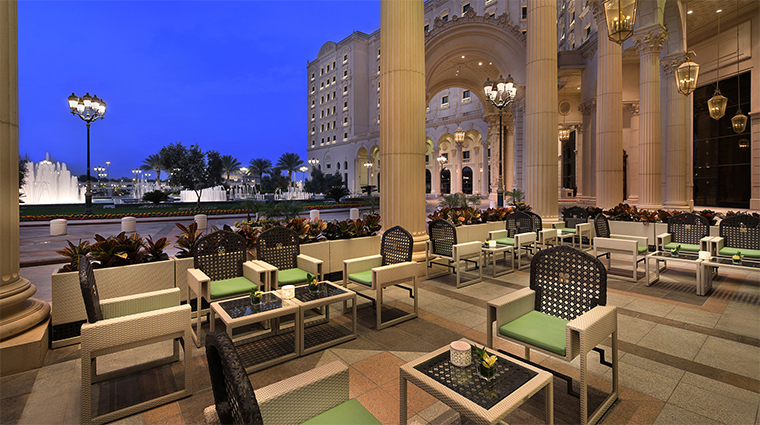 All restaurants at the Riyadh hotel serve mocktails crafted by the resident master mixologist. These refreshing non-alcoholic sips run the gamut from simply sweet to complex — try the Arabic Garden, a refreshing fusion of carrot, orange and ginger with a hint of spices. 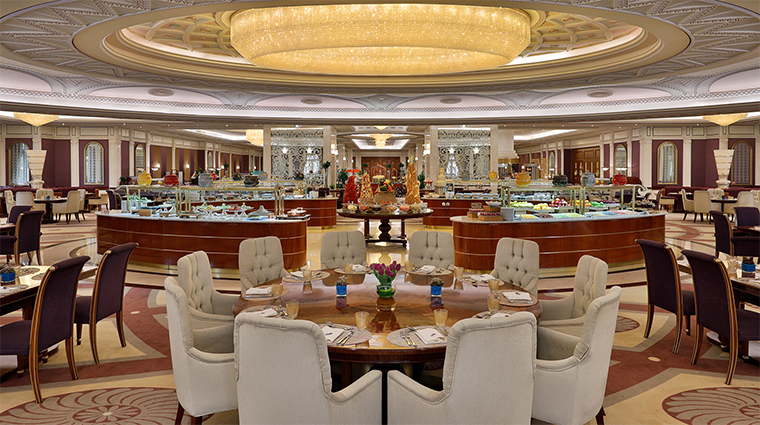 Al Orjouan is the crown jewel of The Ritz-Carlton, Riyadh, providing a variety of Middle Eastern and international cuisine for breakfast, lunch and dinner. It is the place to be seen on Fridays for one of the city’s most elegant brunches. Make the most of the expansive grounds by indulging in high tea at Chorisia Lounge. 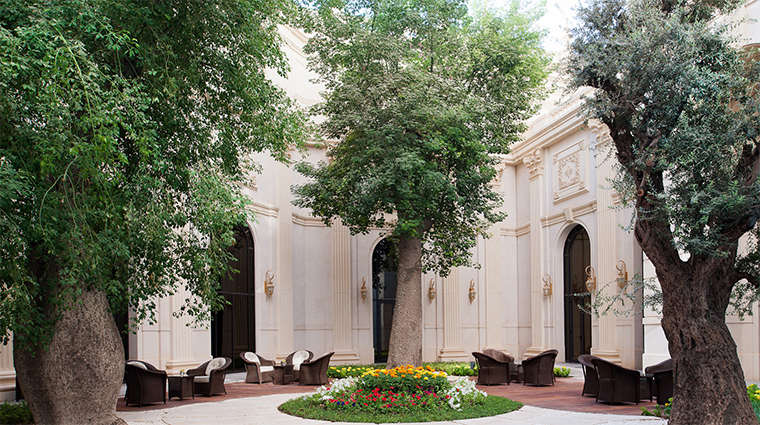 Be sure to grab a table outside in the courtyard underneath the 400-year-old South American chorisia and 600-year-old Lebanese olive trees. Some hotel areas are restricted to male guests, including the pool, spa and fitness center. Ladies enjoy access to a dedicated gym as well as the co-ed Turquoise Cigar Lounge. Female guests get exclusive access to the hotel's main gym, sauna and Jacuzzi every Sunday from 9 to 11 p.m. 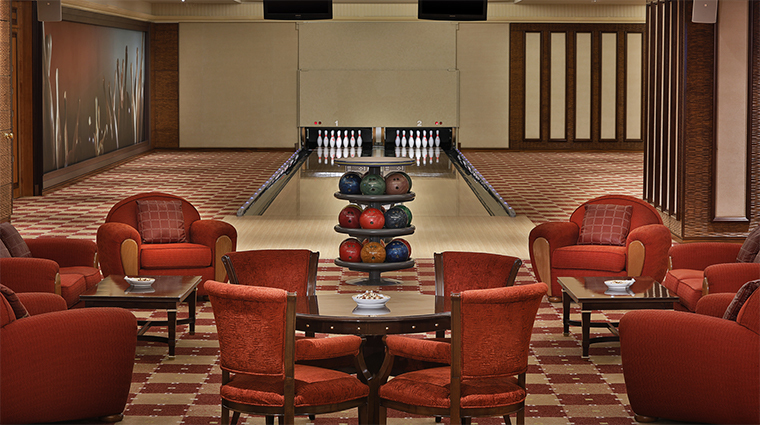 The property is home to Strike Bowling Alley, which offers six full-sized lanes and a billiards table. Thursdays and Fridays are reserved for families, while Saturday evenings are set aside for ladies’ night. 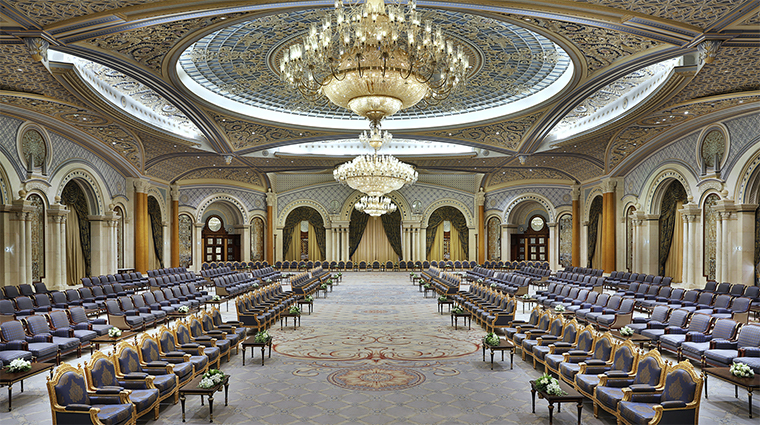 The Ritz-Carlton, Riyadh enforces a strict dress code in accordance with local culture. Skip the shorts, sleeveless tops and T-shirts and opt instead for smart casual or more traditional Saudi attire. Standard rooms at the luxury hotel are classically decorated with crisp white linens, a small but plush seating area and marble bathrooms. 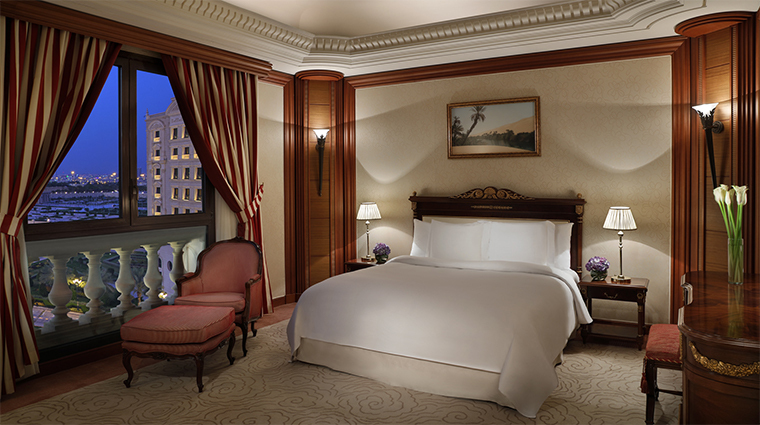 Deluxe Room views are limited, so request a Superior Room to overlook the fountain. The 50 one-bedroom Executive Suites each have more than 1,000 square feet, including a separate living room. 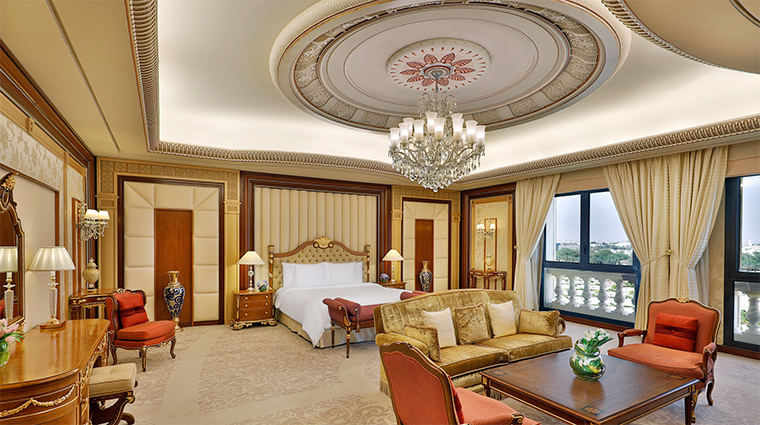 There are 48 Royal Suites that offer more than 4,500 square feet of room for a VIP experience. These two-bedroom accommodations include two marble bathrooms (plus two water closets), a separate office, a seating area, a 14-seat dining room and butler service upon request. 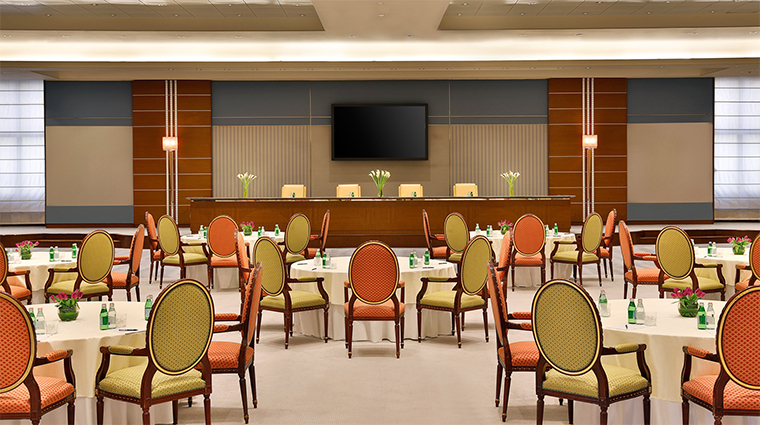 Club Level rooms allow access to the Club Lounge, an exclusive space overlooking the hotel’s gorgeous indoor pool that features a business center and almost constant culinary presentations throughout the day. Don’t miss the chocolate and cookie offering before bed. Named after the Chinese word for red, Hong will transport you from the deserts of Saudi Arabia to the streets of Shanghai. 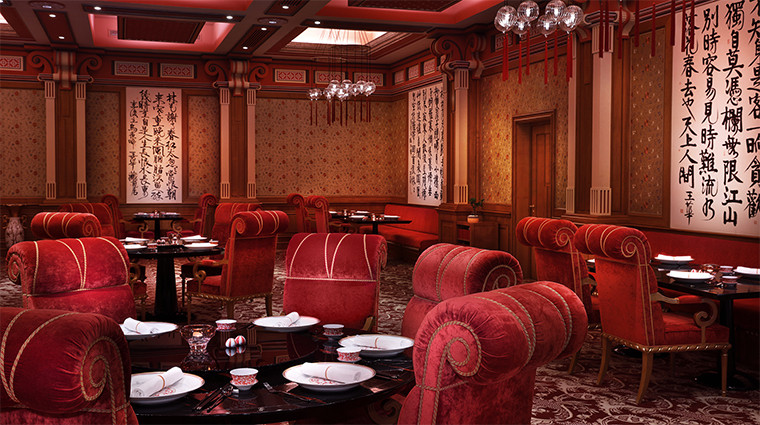 The traditional décor is eye-catching, the Chinese tea-pouring ceremony is elegant and the dim sum and Peking duck are not to be missed. 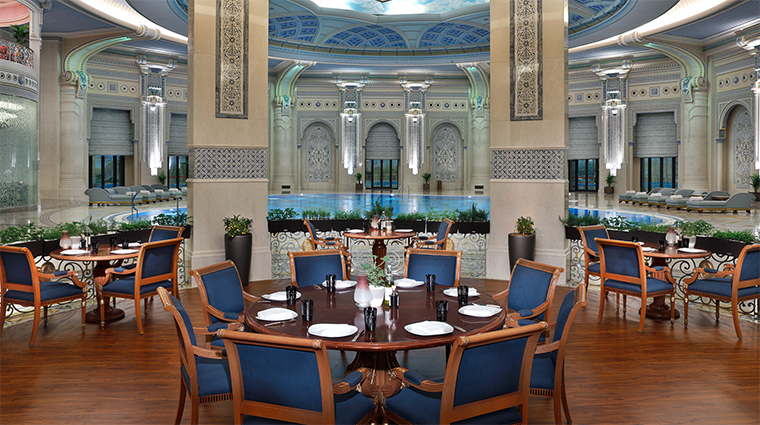 Italian restaurant Azzurro is delicately accented with light blue details adjacent to the elegant indoor pool. Enjoy fresh pasta or classic pizzas made from seasonal ingredients paired with Saudi champagne (a non-alcoholic regional favorite). 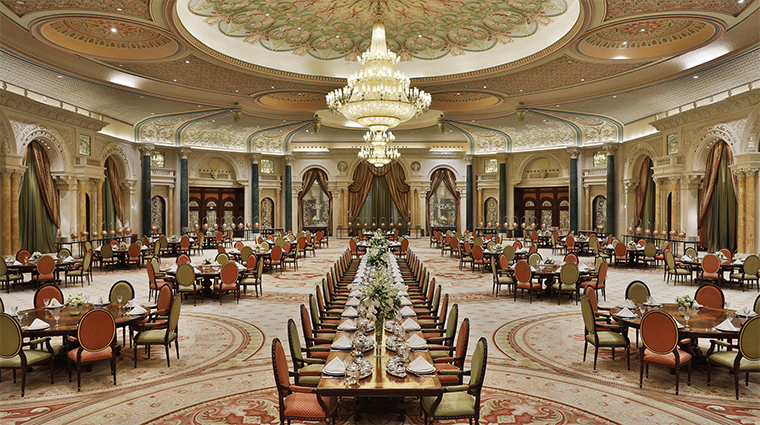 During the holy month of Ramadan, The Ritz-Carlton, Riyadh is the place to indulge in an iftar buffet befitting royalty after sunset. Hosted in one of the enormous ballrooms, the not-to-be-missed feast features live cooking stations, decadent desserts and dedicated kids areas to keep the little ones entertained. Sweets of Arabia features a variety of housemade confections that showcase local flavors, like dates, honey and rose water. Pair them with coffee on the patio with views of the impressive fountain.